Strato® is the software dedicated to the tunnels design. With the specific module you can manage the theoretical sections of a tunnel for accounting purposes. These are then superimposed on the measured sections. You can calculate the areas and volumes of underbreak and overbreak sections detected compared to the theoretical sections, with its highlighting accounting. There are two different modules dedicated to galleries. Sections survey is performed with topographic instruments, by measuring points that compose the tunnel roof. You can calcolate underbreak, overbreak and thoretical areas and volumes, compared to theoretical project section or between two different section. In this case the points cloud is detected by terrestrial laser scanner. From the points cloud you can extract sections at user-defined intervals, with the possibility to configure the width of the section to be extracted and the minimum distance between points. 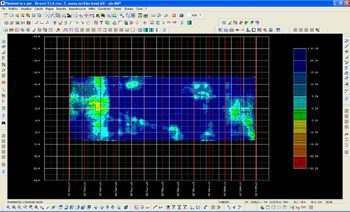 With this module, in addition to the areas and volumes calculation, you can be represent in graphical form, with customizable color scales, underbreak and overbreak areas. You can also calculate and visualize the degree of roughness of the roof detected with respect to theoretical project sections.